We want the Wyndham Grand Agra to be the first choice luxury hotel in Agra for the world travellers and meeting and event planners alike. A beautifully made palatial hotel is the First Luxury property of Wyndham Group of Hotels in the Indian Subcontinent. Wyndham grand has been conceptualized on the Mughal era architectural theme & has got the feel of the Taj Mahal the seventh wonder of the world. We are always looking for the best people to help us deliver levels of service to match our glorious facilities. 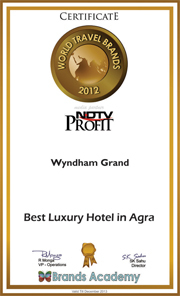 Wyndham Grand Agra is the crown jewel of the Wyndham family. Situated in key destinations around the world, each Wyndham Grand hotel and resort is a one-of-a-kind experience with a compelling local flavor. Here you will find attentive service, relaxing surroundings and thoughtful touches you expect from Wyndham - on a grand scale. Guest rooms are comfortable and refined...dining experiences are crafted by expert chefs...and artfully appointed lounges and public areas invite you to linger. Wyndham Grand properties are also ideal for large-scale social engagements and business events. Flexible meeting spaces, elegant halls and sophisticated entertainment and presentation capabilities ensure a memorable and successful event.